Fresh berries never last long in my household. Between my two boys and I we are able to eat almost our weight in blueberries, blackberries and raspberries during the summer months. Growing up there was a large patch of wild blackberries that we would go every summer to pick. We would collect as many fresh berries as we could carry home and my mother would bake pies and desserts for weeks. I remember being covered head to toe in berry juice and being as happy as can be. My two boys seemed to have inherited my love of all things berries, they will go into the fridge and sneak as many as they can get their hands on. Luckily berries have been inexpensive recently so I have been baking and cooking with them frequently and allowing my boys as many bowls as they can handle (within reason). This week I tried a new recipe for Mix-It-Up Muffins from the June 2013 issue of Parents Magazine. This recipe has 13 ingredients. It takes 35 minutes of total time, 15 minutes of which is active and makes 10 muffins. I did make a number of changes to the original recipe. First, I made two batches of muffins, one gluten-free and one regular. I made half the muffins with carrots and raisins (not pictured) and half dark chocolate-raspberry. As I always do when making muffins I used foil liners. 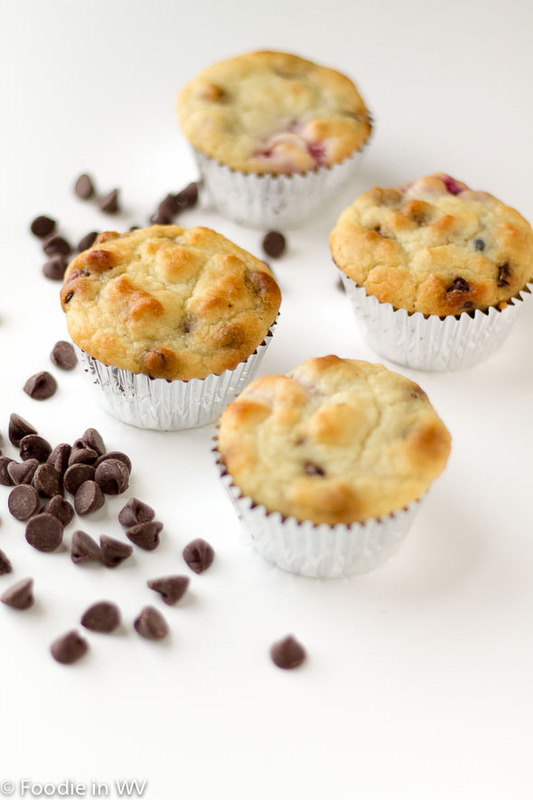 They are so much easier to unstick the muffins from, especially when using gluten-free flours. One step that the recipe leaves out is to roll the berries in a small amount of flour before adding them to the batter. This allows the berries to not 'bleed' into the rest of the muffin batter. My youngest son was a larger fan of these muffins than my oldest. I would suggest a few changes to the original recipe. First the raspberries ended up a little soggy in the recipe. I would cut the overall amount used or switch to using blueberries and roasted cut-up almonds instead. The recipe would also work well with the dark chocolate chips and dried blueberries, cherries or cranberries. This would also keep the berries from making the muffins soggy. The nice thing about this recipe is that it can be modified very easily to suit your tastes and what you have in your pantry. White chocolate chips, nuts, raisins and dried coconut would all work very well with the original recipe. I miss having berry bushes so available! W had wild raspberries and blackberries when I was a kid. We had raspberries and blackberries too. They are so good fresh! Thanks for the nice comment! I love berries too. These look really delicious! Great minds think alike :) I am a huge dark chocolate fan, I could eat it in almost any baked good! I wouldn't like my muffin soggy, either. We eat LOTS of berries during the summer time, too! So good. My youngest said he didn't think they were soggy, so each person is different texture wise :) Berries are great I agree! Pinning and visiting from What to do Weekends party from Crafts a la mode. Thanks for the pin :) Going over to return the favor! Dark chocolate and fresh raspberries? It doesn't get any better than that combo! It is one of my favorite food combos, yum! I saw these at Foodie Friday - they look right up my alley! Thanks for stopping by :) I love anything with dark chocolate and fresh berries are a staple in my house during the summer! Thanks :) The nice thing is that the recipe can be modified to add whatever nuts, fruits etc that you would like. I agree, those are the memories that last :) Thanks for the sweet comment! Thanks :) Have a great weekend also! Chocolate and berries go together perfectly! Dark chocolate is my preference too. Nice! I've never baked with raspberries before, but I love basically all fruit. Visiting through the What to do Weekends! They are great in tortes and coffee cakes! Going over to check out your site! we love berries, too, but they are so expensive here. so...raspberries and blackberries rarely make it to the checkout. we do get a lot of strawberries and blueberries, tho! the berry + dark choc combination sounds wonderful! OMG I must try these. I love raspberries and dark chocolate. In fact one layer of my wedding cake was chocolate cake with a raspberry mouse. Yum! Those two things go so well together. I am a huge fan of dark chocolate, it is delicious!